When we talk about a platform to strengthen and embellish technical skills, and develop innovation in young engineers, one which is bound to cross our minds is Formula Student (FS). Formula Student is the biggest engineering design competition in which teams from all over the world conceive, design and fabricate a single seat formula style vehicle, and compete in static and dynamic events. It is held annually in United Kingdom, Germany, Australia and many other countries around the world. Formula Student is the most established engineering educational competition in Europe. It aims to develop enterprising and innovative young engineers and encourage more youngsters to take up a career in the world of engineering. Out of all Formula Student Competitions the most challenging one is Formula Student Germany (FSG). It stands distinct due to its competitive criteria for participation. By the rating of applications and qualifications it is the toughest contest of all FS competitions. Unlike all other FS competitions, to compete in FSG, teams are required to pass through an arduous phase of registration quiz where their technical knowledge is judged. Because of its exacting criteria, only 60 teams out of 150+ qualified this year. 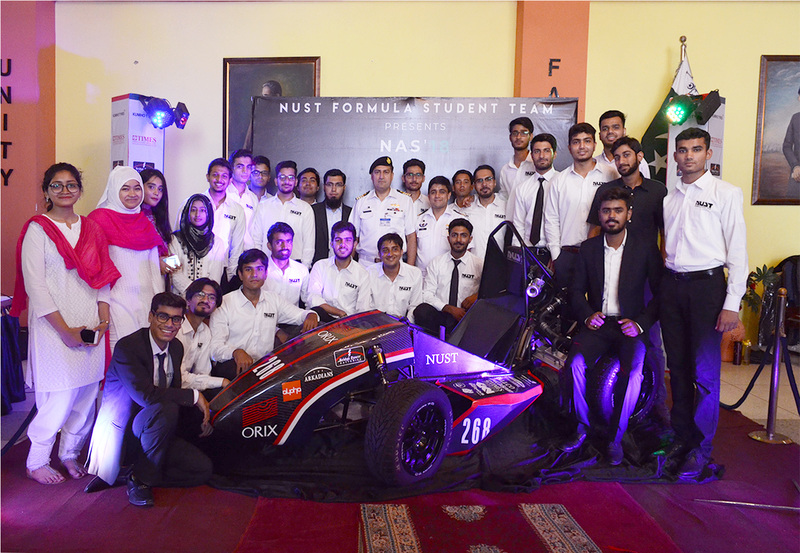 With the aim to tackle the Formula world, NUST Formula Student team set its sight on FSG yet again. The preparation started about a month before the quiz. From the moment the team set its sight on FSG, every member’s days and nights became a constant struggle. Every day all members assembled to study, prepare and test themselves for the upcoming quiz. This became exceptionally harder for them when their final examinations were scheduled in the same month. Even after the completion of exams, no hostel dweller visited his family, instead the whole vacations were dedicated to this goal. A game plan was prepared for efficient results, and every member trained himself according to it. The first setback came when the pattern of quiz was revamped just few days prior to it, resulting in a rise of difficulty to another level. In order to overcome the hardship of the situation, the strategy was changed again and then revised again for the third time, along with the increased time period of each individual’s struggle. The team prepared each and every member to shortlist the worthy fifteen among themselves. After an overwrought month the time came, when behind closed doors, the best fifteen members were fighting an uphill battle for ninety long minutes, leaving the rest of team with their anxiety marking the sky waiting for this phase to be over. But the most apprehensive stage was yet to pass. The result was scheduled to be posted at 10 O’ Clock on the same day. The team passed through a stressful waiting stage of ten long hours and when the clock hit 10, the vexation in every member shot up as the result announcement was delayed till 2:30 am. After a wait of another four and half hours, the result was finally announced and every ounce of hard work, dedication and commitment bore fruit as NUST formula Student team qualified yet again for Formula Student Germany and managed a place among the top 10 teams from all over the world and turned out to be one of the only two teams to qualify from South Asia. And again, became the only team to secure the honor of representing Pakistan in Formula Student Germany. It is rightly said, “Teamwork makes the dream work.” The team is fuelled up and ready to raise the Pakistani flag once again in Germany.